Research has long substantiated the fact that living with a disability creates significant and complex challenges to identity negotiation, the practice of communication, and the development of interpersonal relationships. Furthermore, individuals without disabilities often lack the knowledge and tools to experience self-efficacy in communicating with their differently-abled peers. So how do these challenges translate to the incorporation of disability studies in a classroom context and the need to foster an inclusive environment for differently-abled students? Bringing together a range of perspectives from communication and disability studies scholars, this collection provides a theoretical foundation along with practical solutions for the inclusion of disability studies within the everyday curriculum. 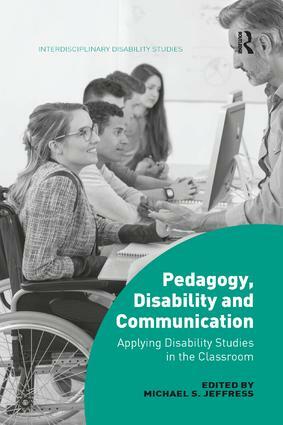 It examines a variety of aspects of communication studies including interpersonal, intercultural, health, political and business communication as well as ethics, gender and public speaking, offering case study examples and pedagogical strategies as to the best way to approach the subject of disability in education. It will be of interest to students, researchers and educators in communication and disability studies as well as scholars of sociology and social policy, gender studies, public health and pedagogy. It will also appeal to anyone who has wondered how to bring about a greater degree of inclusion and ethics within the classroom.